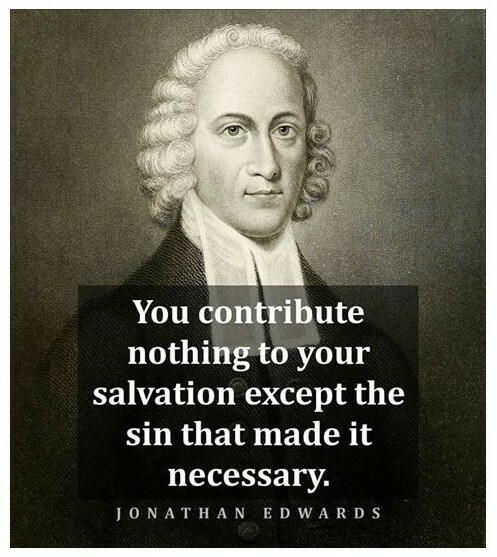 I admire Jonathan Edwards. Have many of his sermons in my library. went forth out of the ark." Yeah it's nice to revisit these points. They are calming. Of course, we know that our enlightenment didn't stop, but continues onward just as the universe does, which is the living body of God. And we are particles within it. And our understandings grow and deepen as we mature, and I'm sure Edwards' did too. I know that we contribute almost wholly to our "salvation" as we learn and grow, and the greatest act is getting "ourselves" out of the way of the natural flow that is God. Then we feel it pour thru us. What a deal that is! In this sense, it's really almost wholly given into our hands, as it is given to the living cherry blossom that turns itself to a sweet orb of dangling fruit, then drops away and separates itself from it's own "parent" host, and then contributes its whole being to the great schematic of Life, just as we all do. No need really today, to condemn ourselves as "contributing nothing." We contribute everything, whether we are flawed or not. Our beings are the embodiment of our contributions, and we are made to give them. Our "sin" is a brain that is confused and immature and wants to get in the way of life and claim godship of its own..., until we finally mature and the follies drop away. Thank goodness for that part.